Henry VIII is a BBC television film adaptation of William Shakespeare’s original play which provides a dramatized account of the events surrounding the divorce of Henry VIII from his first wife, Katherine of Aragon. Originally broadcast in February 1979; the film was produced as part of BBC Shakespeare (1978-85), a series of Shakespeare plays adapted for television. 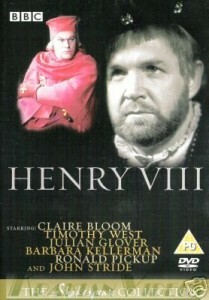 The film was directed by Kevin Billington (Outside Edge, The Good Soldier) with John Stride (Macbeth, The Omen) playing Henry VIII alongside Timothy West (Crime and Punishment, Eastenders), Ronald Pickup (Best Exotic Marigold Hotel, The Chronicles of Narnia), Claire Bloom (The King’s Speech, Clash of the Titans), Julian Glover (For Your Eyes Only, Indiana Jones and the Last Crusade), Jeremy Kemp (Z-Cars, Space: 1999) and Peter Vaughan (Porridge, Game of Thrones). 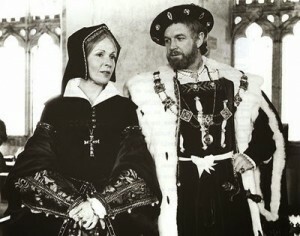 The entire film was shot on location at Hever Castle, Leeds Castle and Penshurst Place, which all have an association with the historical figures within the play. Leeds Castle doubles as Henry VIII’s palace. Both interiors and exteriors are used to create a sense of real grandeur. Penshurst Place was used for a number of scenes, including Katherine of Aragon’s residence, a council chamber at Westminster. Baron’s Hall was used as a hall in Blackfriars when it announced that Henry and Katherine shall split. One of the halls is used to double as a room in York Place where Cardinal Wolsey holds a ball; this is where Henry VIII and Anne Bullen first meet. The timber-clad section of Hever Castle is used to double as streets in Westminster where two gentlemen meet to discuss the royal divorce. Leeds Castle is set in 500 acres of beautiful parkland and formal gardens and has been used in various productions, including the ITV version of Henry VIII (2003), Lady Jane (1987) and Kind Hearts and Coronets (1949) . Hever Castle is a thirteenth century castle which was once home to Anne Boleyn; it boasts formal Italian gardens and an ornamental lake. This location has also been used in various historical dramas, including Walking through History (2013), Inkheart (2008) and Anne of The Thousand Days (1969). Penshurst Place is a Medieval and Tudor Fortified Manor set in gorgeous parkland. It is a film friendly location, having been used in notable productions such as Wolf Hall (2015), The Great Fire (2014) and Merlin (2008). This film was originally broadcasted on 25th February 1979, and is available to purchase on DVD. This entry was posted in Filmed in Kent and tagged feature film, Henry VIII film locations, Hever Castle, Leeds Castle, Penshurst Place. Bookmark the permalink.